How much does it cost to travel to Alaska? How much money will you need in Alaska? $198 is the average daily price for traveling in Alaska. The average price of food for one day is $45. The average price of a hotel for a couple is $224. Additional pricing is in the table below. These average travel prices have been collected from other travelers to help you plan your own travel budget. Alaska joined the United States of America as the 49th state. The US purchased the area from the Russian Empire in 1867 for just 7.2 million dollars (about two cents an acre). It became an organized territory in 1912 and a state in 1959. It is separated from the rest of the country by Canada and, although it is the largest state, it is the least densely populated and for many years had the lowest population. It covers an area equal to California, Texas and Montana combined and lies on the Arctic Circle. Many people consider Alaska to be the United State's "final frontier" because of its vast wilderness. It is also where you will find the highest point in North America. Because Alaska is so large with such a range of elevations, the climate is quite diverse. The climate in the southeast is a mid-latitude or subarctic oceanic climate. This is the wettest and warmest part of the state. In Anchorage and the south central part of the state the climate is milder than most areas with less rain. Western Alaska is effected by the Bering Sea and the Gulf of Alaska. It receives a lot of precipitation but has milder temperatures than you might expect. Interior Alaska is subarctic. Here you will find both the highest and lowest temperatures in the state. Alaska is all about the natural beauty and wildlife. The vast size and remote nature of the state means that you can't possibly see all that it has to offer. Popular places to visit include Denali National Park, Prince William Sound, the Inside Passage and the Kenai Peninsula, among many, many other areas. Alaska can be divided into five regions. Southeastern Alaska includes the Panhandle and Inland Passage. Southcentral Alaska includes Anchorage and the Kenai Peninsula. Southwestern Alaska includes the Alaskan Peninsula and the Aleutian Islands. Interior Alaska is where you will find Fairbanks and Arctic Alaska is where you will find Barrow, Nome and Kotzebue. Alaska has no shortage of activities for wildlife lovers or adventure seekers. Popular activities include fishing, whale watching, rafting, glacier hiking and helicopter tours. Food in Alaska is notoriously expensive, although portions are usually generous and filling. There are local diners in most towns and they serve good breakfasts that often include reindeer (or pork) sausage, eggs, and hash. 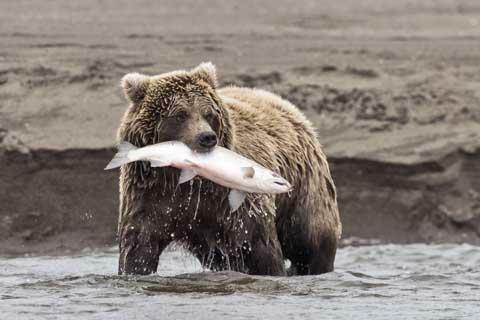 Uniquely Alaskan foods include fireweed honey, spruce tip syrup, and pretty much any type of seafood. King and snow crabs are some of the most popular as is halibut and salmon. The "catch of the day" is almost always fresh and local, so you can't go wrong. Although restaurants in Alaska are expensive, it is worth it to splurge for some unique Alaskan meat or seafood. When else will you have this opportunity? Traveling around Alaska can be a challenging and expensive ordeal because of the state's vast size and widespread wilderness. Many cities are only accessible by sea or air, making independent travel cumbersome and extraordinarily expensive. For this reason, many people choose to take a cruise to Alaska. Still, if cruises aren't your style and you have the money to pay, seeing Alaska independently can be very rewarding and life changing. Alaska Airlines has a virtual monopoly over flights within the state, so prices stay high. There are frequent flights between Anchorage and Fairbanks as well as flights to regional hubs like Bethel, Nome, Kotzebue, Dillingham, and Kodia, among other communities. Smaller communities are served by regional jet and turboprop commuter airlines and smaller towns and villages are accessed with scheduled or chartered Bush flying services. The famous Alaska Railroad travels from Seward through Anchorage, Denali and Fairbanks to the North Pole. There are also off shoots to Whittier and Palmer. There are private companies that offer luxury cars which are also pulled by the Alaska Railroad. In the past these cars were used by cruise lines but now it is possible for independent travelers to make reservations as well. The road network in Alaska covers a very small part of the state. The central population centers are connected to Canada by the Alaska Highway, which is the main route out of the state. There are a few bus and shuttle services that travel between major cities in the state but there are no Greyhound, Chinatown or Megabus services within the state. Cruises are one of the easiest and most efficient ways to see the state. Cruiselines that travel to Alaska include Holland America, Princess Cruises, Adventure Life, Norwegian, Carnival, AdventureSmith Explorations and Regent Seven Seas.